Looking for a new book to buy? 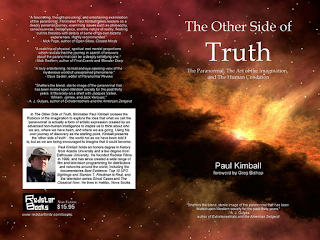 Well, here's one I definitely recommend: The Other Side of Truth, the first book from Paul Kimball of Red Star Films. Now, before anyone moans, complains or gets on their high horse, yes, Paul is a good mate of mine. But, no, that does not have a bearing on the fact that I'm about to give the book a good review. If I hated TOSoT, or thought it was deeply flawed, I'd say so, and I'm sure Paul would appreciate the honesty, even if he didn't agree with it. So, this is not some exercise to massage Paul's ego or to do a mate a favor. And if you were thinking of making such an observation, keep your gob shut. With that said, let's press on. I approached the reading of Paul's book with a great deal of interest for a couple of reasons: one being that it's his first book, and that in itself is a good enough reason to both read and review anyone's book. Second, Paul has a lot of intriguing thoughts and ideas on the world of the paranormal, and I knew that, on reading the book, those same thoughts and ideas would flow out in fine form. And they do. The Other Side of Truth is very much a personal odyssey that sees the Earl of Nova Scotia (that's Paul, by the way) traveling the globe (quite literally) in search of the answers to numerous mysteries, including UFOs, ghosts, life-after-death, synchronicities, time-travel, the meaning of existence, the nature of reality, and much more. In other words, this is a first-person road-trip of definitive supernatural proportions. But it's far more than that, too. TOSoT is also the deeply personal story of one man's immersion in a strange world, of his realization that there are mysteries to be found and solved, and of his ultimate conclusion that life is very much a learning process - a journey to be experienced and embraced, both in the "normal" sense and in relation to the realms and worlds beyond our own. And Paul skilfully (and time and time again) demonstrates something in the pages of his book that many people who have dug deep into paranormal phenomena have experienced: namely, that when you go looking for the unexplained, the unexplained sits up and takes notice of you. That's to say the investigator very often goes from being a detached observer to a key and integral player, one who experiences a distinct sense and escalating suspicion that there are higher forces out there guiding and manipulating their actions, ensuring they are in the right place at the right time, and also acting as teacher as the learning process progresses. Hence the fascinating data that Paul includes in the book on countless synchronicities that he experienced during the course of important investigations and experiences in his daily life. But this is no normal learning/teaching process. I always find it kind of amusing that both ufological skeptics and believers often ask the question: "Why don't the aliens land on the White House lawn?" Well, first, that suggests "they" (whatever "they" may be) have a bias towards one country over another, which would seem - to me, anyway - to be pretty illogical for a non-human species. Second, the question says less about Fortean forces out there and how they might operate, and far more about how we, as a species, might contact the people of other worlds. So, we assume - probably wrongly and certainly arrogantly - that they would do something broadly the same as us. And third, it implies these intelligences are just like us, albeit more technologically advanced. Nothing could be further from the reality of the situation. As The Other Side of Truth reveals, what appears to be genuine alien contact (and "alien" is intended here to mean a definitive "other" - perhaps extraterrestrial or maybe something even stranger) takes some undeniably alternative and even bizarre routes as it seeks to provide the clues and answers to those that go looking for them. And I mean really alternative and really bizarre routes. If there's one thing - maybe more than any other - that I've found when it comes to investigating Fortean phenomena, it's the sheer, astonishing extent to which those same phenomena interact with us on an incredibly one-to-one basis when we seek them out. And Paul's book typifies this. But, the lessons we are taught, as Paul shows, are not dished up on a plate in easy to digest fashion. Rather, we are given snippets of data, and we are encouraged to seek the answers, to understand them, to learn from them, and to grow. Or not. The choice is ours. TOSoT makes it abundantly clear to me that we are being offered incredible gifts by something, but if we choose not to take them, the loss is ours, and the phenomena then move onto the next person that ponders and wonders, and the next, and so on and so forth. Paul is one of those that has chosen to accept those gifts, opportunities and insights into the bigger world around us - even if he doesn't have all the answers, or a complete picture of who or what it is that offers us those same gifts, opportunities and insights, or a full understanding of where this journey of life is leading. But he realizes that something very extraordinary is afoot and goes after it, and recognizes when it impacts on his life, such as in those sections of the book that deal with the importance of those aforementioned synchronicities in critical, potentially life-altering events that can push us down varying pathways, depending on how we choose to respond. So, what we have with The Other Side of Truth is one man's long and winding, personal transformation and his journey into a world populated by some form of intelligence that knows us far better than we know ourselves and from which we can learn a great deal - if, when it enters our lives, we choose to do so. Paul has looked for those answers, he wants those answers, and he's found some of them. And in doing so, he has lived and learned. You can do that, too. And reading The Other Side of Truth is a great place to start. What I fear is that TOSoT is gonna be so darn good, Paul is gonna have a really hard time surpassing it with his next book.